Andy Dawson is a mechanical engineer with over 50 years’ experience designing, engineering and driving motorsport vehicles. He has engineered wins in over 120 motorsport championships worldwide, and is currently Chief Engineer for Abarth Racing UK. Andy is the first to beat the 100 miles per gallon barrier in the MPG Marathon. In a rally driving career spanning over two decades, Andy pushed some of the world's most iconic rally cars to their limits and surpassed all expectations. From tearing around the fields in a go-kart at his childhood home, to a record-breaking international rally champion; how did Dawson do it? Although Andy took a step back from the worlds of rallying and racing in the early 90s, he remained involved with the industry as a designer, consultant and motorsport journalist. 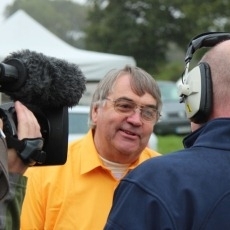 He is perhaps best known for his "Dawson's Dodges" series, printed in Car and Car Conversions in the 1970s and reprinted in Track and Race Car magazine some 30 years later. Andy Dawson was renowned in the 1970s and 80s as a world rally championship driver; however his successes on racing circuits may be less well-known. As his career progressed through the late 80s and early 90s, Andy also had successes in Formula 3, Formula Ford and truck racing.